When I started this Spring Training series, I had my Top 5 list ready to go. But, my editor/husband insisted that the Spring Training I attended should be included. So, apologies Limestone League – the World War II-era years when teams held Spring Training north of the Mason-Dixon and east of the Mississippi. French Lick and Terre Haute. Bloomington and Muncie. Number 2 on my list of amazing Spring Trainings is the one I attended in St. Petersburg, Florida. Many people believe that attending Spring Training is the mark of a true baseball fan. To be a true baseball fan is to sit – or, more correctly, stand – through a freezing two-and-a-half hour rain delay during the playoffs only to have your team go down in bitter defeat in the 9th. To be a true baseball fan is to watch your beloved team lose more often than it wins and still love them. To watch them lose 100 games in a single season. To watch them lose 21 in a row. And, still love them. To be a true baseball fan is to say, “We’ll get ‘em tomorrow,” no matter the odds. And, mean it. Spring Training, on the other hand, is just a lovely way to spend a vacation in Florida (or Arizona) during the chilly, waning days of winter. Sandwiching ballgames with a little beach time or tee time or margarita time. For a few years in the 1990s, the St. Louis Cardinals shared St. Petersburg, Florida and Al Lang Stadium with the Baltimore Orioles. There’s a lot of milling about at Spring Training. 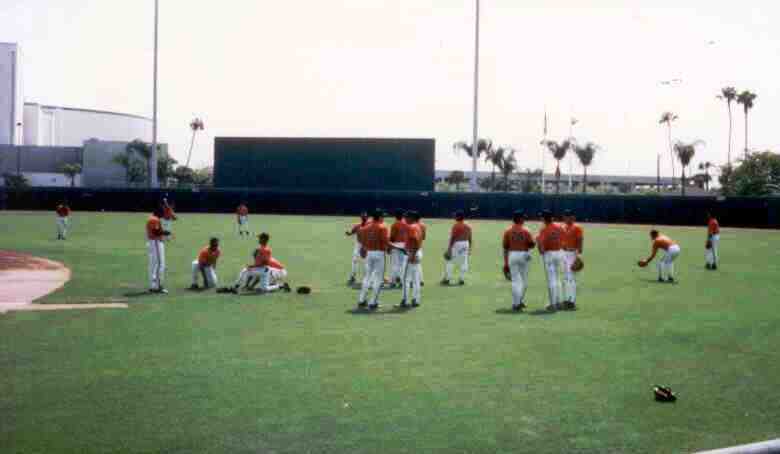 So, in 1992, I went to Spring Training by myself. I was much younger of course (12 would be a good guess, but since I was driving a rental car and drinking beer, though not at the same time, perhaps I was a bit older).